as they face the enemy in foreign lands. Guide and direct their every step, protect their ways and give them energy as needed. start each day, seeking direction in this war. Be with those who have been captured. not even on their own. 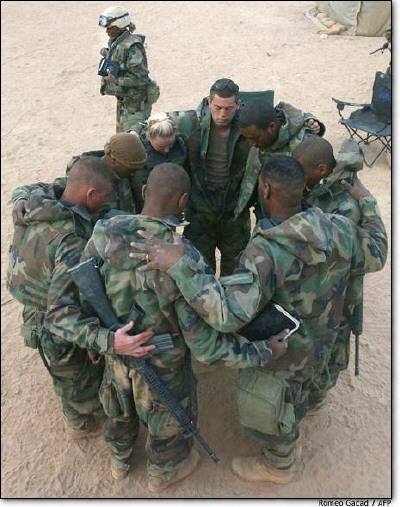 I pray for our servicemen and women who are in the enemy's hands. I pray for their lives and the strength to endure. I pray for their salvation, and ask that they are not stricken from this earth, without knowing Jesus as Lord and Savior. who are fighting against us. Open their eyes to spiritual truth, and enlighten them concerning their evil leaders. and quit using the innocent in their battles as shields. Confuse them and bring our enemies down, that they surrender willingly. Through this O Lord, may You receive all the glory. For I ask this in Jesus' precious name, Amen.